The use of anesthesia providers to deliver sedation during routine gastroenterology (GI) procedures is seen as medically justifiable only for high-risk patients who require intensive monitoring. But between 2003 and 2009, the proportion of GI procedures involving anesthesia providers doubled, and overall payments for GI anesthesia tripled. The use of anesthesia providers varied by almost a factor of four across U.S. regions. The majority of patients who received sedation from an anesthesia provider rather than the endoscopy team were not high-risk patients. Eliminating potentially discretionary use of anesthesia providers for low-risk patients could generate $1.1 billion in savings per year. As health care spending continues its seemingly relentless increase, pressure has intensified to identify low-value procedures and services that might be curtailed without harming patient health. Reducing use of anesthesia providers during low-risk gastroenterology (GI) endoscopies has been suggested as one such area. Under current guidelines, the endoscopy fee includes intravenous sedation administered by the endoscopy team. If an anesthesiologist or nurse anesthetist delivers and monitors sedation, an additional payment is required. The additional payment is medically justifiable for high-risk patients who require intensive monitoring even during minor procedures — for example, patients with serious chronic heart or lung disease. However, there is no medical necessity to involve an anesthesia provider in low-risk cases for whom intravenous sedation can be safely administered by the endoscopy team. Might use of anesthesia providers for low-risk patients undergoing routine GI procedures be a target for cost savings? The answer is yes. An interdisciplinary RAND Corporation team of physicians and health policy analysts examined claims data for 6.6 million patients from 2003 through 2009. Their bottom line: About $1.3 billion was spent annually on anesthesia providers during GI procedures in 2009. Of that sum, only about $0.2 billion was spent on high-risk patients. The remaining $1.1 billion per year, which was spent on use of anesthesia providers for low-risk patients, constitutes potentially discretionary payments and could be a source of substantial savings. To quantify the use of GI anesthesia providers, the RAND team examined claims data from a nationally representative sample that included 1.1 million Medicare fee-for-service patients and 5.5 million commercially insured patients. Between 2003 and 2009, the overall number of colonoscopies and upper GI procedures rose substantially (Figure 1). 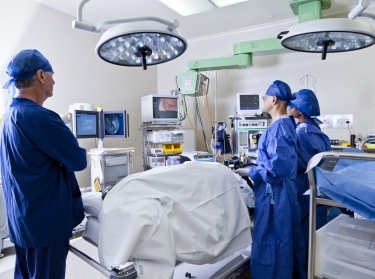 An estimated 81.9 million GI procedures were performed between 2003 and 2009. Procedure volume increased by about 26 percent, climbing from 9.9 million nationally in 2003 to 12.5 million in 2009. Among Medicare patients, the number of GI procedures per enrollee was virtually unchanged over the period. However, among commercial patients, procedures per enrollee increased by more than 50 percent. The proportion of these procedures that involved an anesthesia provider doubled in both groups. Among Medicare beneficiaries, annual payments for use of anesthesia providers during routine GI procedures per 1 million enrollees nearly doubled between 2003 and 2009, rising from $2.2 million to $4.2 million. But among commercially insured patients, annual payments more than quadrupled, rising from $1.9 million to $8.4 million per 1 million enrollees. When the research team projected this increase to the national level, they found that $1.3 billion was paid for use of anesthesia providers in 2009, an amount more than triple what was paid in 2003 (Figure 2). The total increase in payments for these anesthesia services was driven by increased use, not increased cost: The payment per service remained largely unchanged for Medicare during the study period and rose only slightly for commercial insurance. Although overall use of anesthesia providers doubled among both Medicare beneficiaries and commercially insured patients, the proportion of procedures that involved anesthesiologists or nurse anesthetists varied substantially by region. Figure 3 illustrates this pattern. In 2009 among Medicare patients, anesthesia provider use was almost four times higher in the Northeast — nearly 48 percent — than in the West, where it was only 14 percent. The regional pattern for commercially insured patients was similar. This regional variation lends support to the finding that a substantial percentage of anesthesia provider usage during GI procedures can be considered potentially discretionary: It is highly unlikely that clinical need varied that much from one region of the country to another. Based on criteria developed by the American Society of Anesthesiologists, the RAND analysts estimated the number of patients who were low or high risk. Overall, about two-thirds of the Medicare patients who received sedation from an anesthesia provider were low risk — that is, their clinical conditions did not require delivery of sedation by an anesthesia provider. In the commercially insured population, more than three-quarters of those receiving anesthesia services were low risk. Over time, the proportion of low-risk patients who received sedation from an anesthesia provider declined in the Medicare population but remained unchanged, at about 85 percent, among the commercially insured. Of the $1.3 billion being paid for the use of anesthesia providers during GI procedures in 2009, only about $0.2 billion was for high-risk patients. Thus, the analysis points to $1.1 billion per year in potentially discretionary spending (Figure 4). Addressing potentially discretionary use of anesthesia providers is a pressing issue because the number of colonoscopies is likely to increase in the coming years: About half of Medicare beneficiaries and commercially insured individuals have never had a screening colonoscopy, which current clinical guidelines recommend. In addition, the Patient Protection and Affordable Care Act, which will expand coverage to about 32 million Americans in 2014, contains specific coverage provisions for preventive services, including screening colonoscopies. Certainly, $1.1 billion per year represents a sizable savings opportunity. However, the use of anesthesia providers for routine GI procedures in which intravenous sedation can be safely administered by the endoscopy team is only one of the many examples of potentially low-value care that should be a major target of cost containment efforts. Harry H. Liu, Daniel A. Waxman, et al. Liu, Harry H., Daniel A. Waxman, Regan Main, and Soeren Mattke, Eliminating Discretionary Use of Anesthesia Providers During Gastroenterology Procedures Could Generate $1.1 Billion in Savings per Year. Santa Monica, CA: RAND Corporation, 2012. https://www.rand.org/pubs/research_briefs/RB9648.html.